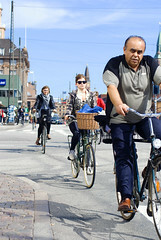 Some of my friends and acquaintences are contributing to the social documentary of a cycling life in Copenhagen. I figured I'd showcase some of them today. Above are two shots from Lars, who contributes regularly. I enjoy the contrasts. All of them. Here's another great contrast in a photo from Lyvemaskine, another Copenhagener. 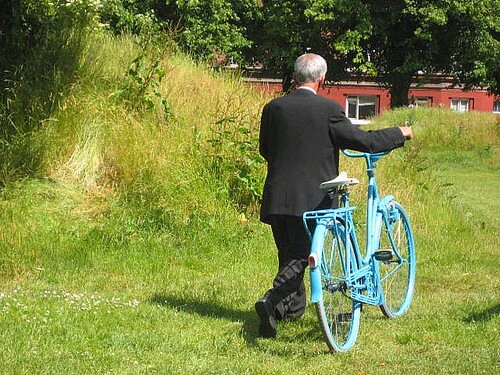 Smart suit and a very, very blue bike. Here's two brilliant shots from Johan, known as the Diamond Field on Flickr. He's a Swede but that's close enough. In other, unrelated 'news', I have a new blog that I like. Luxuo - The Luxury Lifestyle Blog. Nothing to do with cycling, just a gorgeous advert. Sure it's a completely over the top advert for Louis Vuitton, but the cinematography is exquisite. 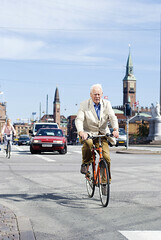 And this new advert for SAS [Scandinavian Airlines] features a bicycle in New York. It's a Danish actor, Nicolaj Coster Waldau, playing himself. This series is brilliant. It hits the nail on the head for Danes and Scandinavians. Getting to the airport, ready to head home, seeing an SAS plane or even the logo makes you feel like you're halfway home. I can't imagine that all that facial hair is at all aerodynamic. I wonder if he carries a little comb to tame it at the end of his rides? video works fine for me?! the men who live inside his beard keep it tidy.